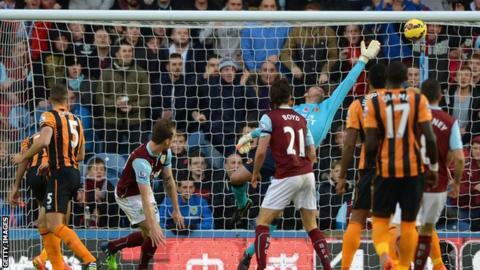 Ashley Barnes ended Burnley's wait for a Premier League win with the only goal of the game against Hull at Turf Moor. The Clarets had not won since returning to the top flight and were the only professional club in England without a victory this season. But striker Barnes secured the three points against Hull with a header five minutes into the second half. Hull were unable to find an equaliser with Abel Hernandez's shot on the turn the best they could muster. The last time the Clarets went longer without a win from the start of a season was a 14-match streak in 1970-71. But this victory, their first since a 1-0 win over Ipswich in the Championship on 26 April, was richly deserved by Sean Dyche's team. The Burnley boss will also have been pleased that his side managed to keep a clean sheet, having conceded 15 goals in their last six Premier League games before this contest. It was their first shut-out since their goalless draw with Sunderland at Turf Moor in the middle of September. Steve Harper replaced Eldin Jakupovic in the starting line-up for Hull following the third-choice goalkeeper's error in Hull's 1-0 home defeat by Southampton last weekend. And the veteran was busier than Burnley counterpart Tom Heaton in the first half as Dyche's side created the better of the chances. Danny Ings went close almost straight from kick-off when he latched on to a high ball and clipped a left-footed shot just wide of the post as Harper narrowed the angle. The Clarets striker, who scored 21 goals in the club's promotion-winning campaign, went close again shortly after with a volley from close range which brought a fine save out of Harper. The hosts continued in the same vein after the interval and were rewarded with a goal five minutes into the second half from Barnes, who was restored the starting line-up having not even been included in the squad for Burnley's 3-0 loss at Arsenal last time out. Kieran Trippier's high cross from the right picked out Barnes, who found space in between James Chester and Ahmed Elmohamady, and planted a powerful header past Harper. Hull boss Steve Bruce introduced Gaston Ramirez, Stephen Quinn and Hatem Ben Arfa before the hour mark in an effort to give his side more impetus. The decision to bring on all three substitutes backfired on Bruce, however, as captain Curtis Davies sustained a back injury 10 minutes later and despite trying to play on, left the pitch as Hull played the remainder with 10 men. Hull striker Hernandez caused a few nerves with a shot on the turn saved by Heaton, but Burnley hung on to secure victory. Match ends, Burnley 1, Hull City 0. Second Half ends, Burnley 1, Hull City 0. Lukas Jutkiewicz (Burnley) is shown the yellow card for a bad foul. Lukas Jutkiewicz (Burnley) wins a free kick in the defensive half. Robbie Brady (Hull City) is shown the yellow card for a bad foul. Foul by Robbie Brady (Hull City). Danny Ings (Burnley) is shown the yellow card for a bad foul. Attempt saved. Lukas Jutkiewicz (Burnley) left footed shot from the right side of the box is saved in the centre of the goal. Offside, Hull City. Steve Harper tries a through ball, but Abel Hernández is caught offside. Attempt missed. Jake Livermore (Hull City) right footed shot from outside the box is high and wide to the right. Assisted by Hatem Ben Arfa following a set piece situation. Stephen Quinn (Hull City) wins a free kick in the attacking half. Attempt missed. Abel Hernández (Hull City) header from the centre of the box misses to the right. Assisted by Robbie Brady with a cross. Hand ball by Abel Hernández (Hull City). Corner, Burnley. Conceded by Jake Livermore. Attempt blocked. George Boyd (Burnley) left footed shot from the right side of the box is blocked. Assisted by Michael Kightly. Corner, Burnley. Conceded by Robbie Brady. Substitution, Burnley. Lukas Jutkiewicz replaces Ashley Barnes. Hand ball by Stephen Quinn (Hull City). Curtis Davies went off injured after Hull City had used all subs. Attempt missed. Abel Hernández (Hull City) left footed shot from outside the box is close, but misses to the left. Assisted by Ahmed Elmohamady. Abel Hernández (Hull City) wins a free kick in the defensive half. Abel Hernández (Hull City) is shown the yellow card for a bad foul. How did Lawro get on against Football Manager?